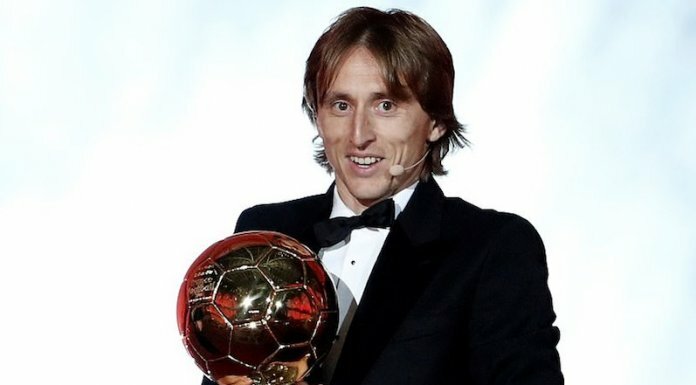 Croatia captain and Real Madrid midfielder,Luka Modric, yesterday won the 2018 Ballon dâ€™Or, becoming the first player other than Lionel Messi or Cristiano Ronaldo to claim the award in more than a decade. Barcelona forward Messi finished fifth, with Atletico Madrid frontman Antoine Griezmann and PSG attacker Kylian Mbappe â€“ both of whom won the World Cup with France â€“ third and fourth respectively. Victory caps a stellar year for Modric, who also was named the worldâ€™s top male player at the Best FIFA Football Awards and received the Golden Ball award for the best player at the World Cup. â€œItâ€™s an unbelievable feeling,â€ said Modric, who is the first Croatian player to win the award. â€œItâ€™s a big pleasure to be here among all these players. â€œI just want to thank all those who helped me to be here tonight. I thank my teammates, my coaches, the staff and Real Madrid, all those who work there, the coaches and teammates in the national team, the ones who voted for me and my family, who allow me to blossom as a person. â€œAlways have dreams, I wanted to play in a big club, win titles, the Ballon dâ€™Or is all I could dream as a child, itâ€™s an honor to win it tonight.